Vista, Bushboard's recently launched collection of statement splashbacks, is now available from one of Ireland's leading trade-only kitchen product and component distributors. Potter Cowan has branches in Belfast, Dublin and Cork and now offers Bushboard Vista alongside a comprehensive collection of household name brands for kitchens, appliances, taps, sinks worksurfaces, and splashbacks. Abacus Bathrooms has developed a unique portfolio of stunning brassware and accessories so that retailers and designers can offer a completely colour-matched scheme in the bathroom. Kitchens International is asking its customers: "Why become a slave to your kitchen when you can control many appliances from an app or even your voice? Luxury kitchens of 2019, it argues, have so many hi-tech options from app-controlled appliances, to sleek downdraft extractors, to the whole systems to control all appliances and many more, that cooking becomes a pleasure rather than a chore. One of the greatest inspirations for modern day interiors, exposed concrete continues to bring texture and stylish urban influences to the home. A bathroom mirror isn't just a mirror anymore now it's loaded with so much style, choice and technology. An illuminated mirror has therefore become a real must have for any new bathroom. Despite being an essential element for shaving and putting on make-up, the illumination now provides perfect lighting for the room whilst making a real design statement. The Cosentino Group has enjoyed another record breaking financial year, maintaining its leadership position in the global market. On Monday I took part in a walking tour of some of London's natural springs and ancient wells - not because as editor of KBzine I've often voiced my support for any scheme that helps conserve water, but because I'm a member of a choir whose leader was asked to co-host the tour. 'The Fellowship of The Spring - London Water Pilgrimage' took a 'human stream' of around 200 of us to some of these ancient water sources and we visited parts of London we never knew existed; a Roman bath for example, much like that in the city of Bath itself, (only far smaller) boasted crystal clear water; in stark contrast to the Thames which flowed just 50 metres away. "Since time immemorial, people all over the world, have held water to be sacrosanct," said our leaders. "Humans have long held pilgrimages to the sources of streams, doused themselves in 'holy' lakes, made offerings on riverbanks or on the shores of oceans. These were not acts of blind worship: but regular, necessary nods to a deeply-known recognition of humanity's dependence on water and a keenly-felt gratitude for nature's benevolence. It is only quite recently that these habits have, for most of us, been forgotten. "By resuming these rituals and behaviours and by caring for and paying attention to our waterways, we grow motivated to defend and protect their right to flow, to be free from pollution and to be able play their vital role in the broader web of nature. Water sustains us and every living thing: it slakes our thirst, it wets the soil and seeds from which our crops spring, it yields us fish. Water is where we go to play. We navigate it for adventure and escape, for discovery and communication, for income, for birth, burial and everything in between. "Disregarding how deeply our lives are intertwined with water- wasting it, exploiting it, dumping waste and chemicals in it-is clearly now to court disaster, and extinction." 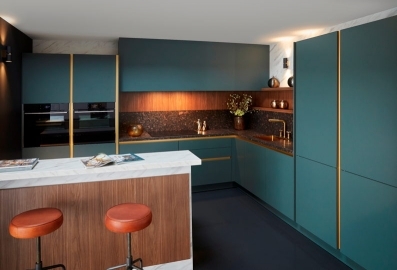 The Kitchen, Bathroom & Bedroom Specialists Association has announced that it will have a number of retail members providing advice at Grand Designs, which takes place in London's ExCel 4th - 12th May. Paying homage to Queen Victoria's 200th anniversary, Franke's 2019 Blooming Great Tea Party fundraiser for Marie Curie, held between 21st and 23rd June, will take on a royal theme this year with its exclusive Victoria Sponge cake recipe specially developed by Regula Ysewijn, an award-winning cookbook author and culinary historian with a love for Britain. Ysewijn's debut book P'ride and Pudding - the history of British Puddings Savoury and Sweet', won the Gourmand World Book Awards 'Culinary Heritage' category in 2017 and she has recently released the National Trust Book of Puddings, which explores nostalgic sweet treats. Keller's new Kitchen Inspiration brochure for 2019 showcases a portfolio of high-quality kitchen schemes that will inspire customers and make kitchen planning a joy. The brochure is packed with beautiful imagery of stylish kitchens and a focus on each model's detail such as handle trims and lacquer cabinetry, to show it off to its full advantage. Offering a full choice of colours, (1,950 NCS to be precise) models and handles, Keller's kitchens' huge portfolio has something for everyone. The brochure comes with an easy-to-read layout so you can help your customers choose a new kitchen which is perfect for them. Electrical buying group Combined Independents (Holdings), part of Euronics, hosted the Euronics Showcase at the NEC Birmingham this month after a three-year hiatus. It was a huge success. The two-day exhibition enabled CIH members to meet with suppliers to familiarise themselves with the latest products and services available, as well as be the first to see new, exclusive, product launches. Hotpoint has launched a new range of Total No Frost fridge freezers that incorporate a variety of technologies to ensure long-lasting food freshness and minimal food waste. Included in the range is the Class 7 Total No Frost fridge freezer, which offers a combined capacity of 368 litres and provides the ultimate freshness for the food whilst offering lots of storage flexibility. Total No Frost technology ensures that the user never has to defrost their freezer again. 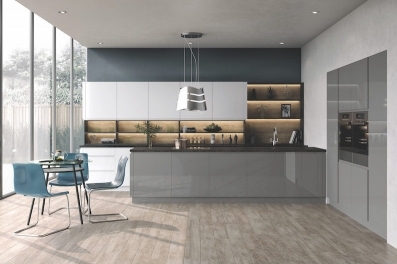 TKC has introduced Dust Grey as a stocked colour to two of its contemporary ranges, Lucente and Vivo+, in gloss and matt, tapping into the trends for grey tones and tactile finishes in the kitchen. Already popular on TKC's Cartmel, Cambridge and Windsor ranges, the versatile Dust Grey colour suits the contemporary styling of the Lucente handleless and Vivo+ slab doors. It also complements a range of woodgrains and metallic finishes to achieve the sought-after mixed material look. LochAnna Kitchens' collection of 17 kitchens, including the recently launched Form range, is now available to download for free on Winner Design kitchen planning software by Compusoft. The 3D software allows retailers and designers to combine hundreds of LochAnna Kitchens door types and finishes to create stunning renders for their customers. "The Winner Design software is easy to use and creates stunning renders that truly do our collections justice," says Sinead Trainor, kitchen category manager for LochAnna Kitchens. Ideal for accommodating large pots and pans that won't fit in the dishwasher and in line with the trend for industrial-style kitchen design, Abode has extended its popular Matrix R15 range of sinks with the launch of the R15 Extra Large Bowl. The Bathroom Manufacturers Association has named the host for the 2019 Bathroom & Kitchen Business Conference, set to take place on 8th October at the stunning Carden Park Hotel, Cheshire. The KBSA has introduced a mediation service for members that can help resolve potential disputes swiftly and economically. The service is provided by Focus Mediation, a company that has an above average rate of over 90% in assisting parties to reach successful settlements and resolutions. The Bathroom Manufacturers Association has responded to a recent statement from Sir James Bevan, chief executive of the Environment Agency, on ways to reduce average water consumption in England from 140 litres per person per day to 100 litres, by claiming that a voluntary - not a mandatory - water label is the best solution. Bushboard, the renowned worksurface and bathroom panelling manufacturer, has secured a patent for its innovative, trim-free waterproof bathroom panelling system, Nuance. Invented by the Bushboard team, the Nuance brand leads the way as a more aesthetically pleasing and easier to install alternative to tiling. LDL has declared its mission to prioritise training and customer service. Recognising the crucial importance of comprehensive product knowledge, the company is now running three product training sessions each week in the new dedicated design room at LDL's headquarters in Glossop. The Kitchen, Bathroom, Bedroom Specialists Association has strengthened its board of directors with the appointment of a new regional chair for the West Midlands. Angela Bower is a director at Bower Willis Designs, a kitchen and interior design showroom based in Shipston-on-Stour, Warwickshire. Leading distributor LDL Components has announced the internal promotion of Oliver Bryant to the position of account manager for the South East. German kitchen furniture supplier Pronorm has announced the retirement of its managing director Heinz Hachmeister after 35 years of service and implemented a succession policy that will provide continuity and growth for the contemporary brand across Europe. Carron Phoenix has launched its new Range brochure for 2019 including the addition of three new product ranges. 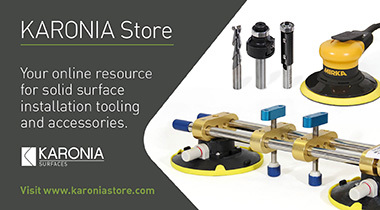 The brochure is available to retailers now via the Carron Phoenix website, www.carron.com for next day delivery, or through their distributors.